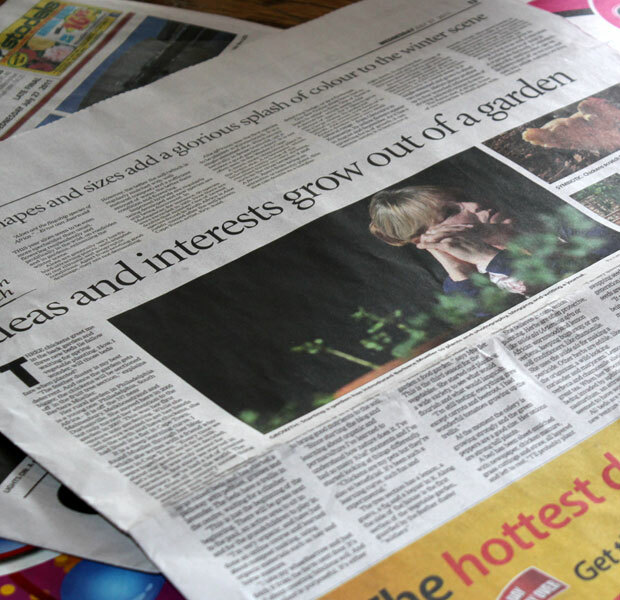 What a wonderful surprise today to open the local daily newspaper, The Cape Argus, and find a huge article complete with photographs of chickens and my best friend in it and an article all about her gardening endeavours! And its not just a small little article tucked away on page 30. No, its right on the front of the Life Style section, occupying a half page spread. Three chickens greet me in the back garden and three new beds lie fallow waiting for spring vegetable planting. How, I wonder, will those beds fare when planted? “The feather duster is my best deterrent. And once the garden gets bigger, the chickens will be sectioned off in the fruit tree section”, explains Barbara Mueller. Her rural garden in Philadelphia is a young one. Philadelphia, South Africa – its off the N7 near Malmesbury, Melkbosstrand and Durbanville. She moved here in 2005 but only turned her attention to the garden in 2007. This was her first venture into gardening. While she had always wanted to get her hands into the earth and have chickens, she had lived in a flat in Cape Town. Over the past few weekends Mueller has been building the three large raised beds and has started a pathway with pebbles, grasses and lavender. The beds have a trellis in the centre, waiting for a climber. “Since starting the blog and learning about organic and permaculture I’ve learned how nature does it. I’ve had so many ‘Aha!’ moments and I’ve started looking at things differently”. “Chickens are my pets but they’re also so beneficial. It’s been such a learning curve, such fun and experimental”. The tree section has a lemon, a fig, a guava and a loquat in it. Along the side of the house is the first section of the vegetable garden, guarded by the feather duster “soldiers”. “I want to make this whole garden a food garden,” says Mueller. This is the third season for the vegetables. She started out planting a wide variety to see what would flourish and what would languish. “I’m still testing; everything grew except carrots and beetroot. I had wonderful tomatoes growing up the trellis”. At the moment the celery is growing strongly and the green peppers are a good size. Her onions are strong tall plants. A bed has been sheet mulched with newspaper, chicken manure, grass cuttings and straw, all layered and left to rest. “I’ll probably plant sunflowers and mealies here”. She believes in companion planting. Herbs are often protective like wilde als (Artemesia afra or African wormwood) and lemon verbena, keeping bugs away, or are soil conditioners, like chamomile. She uses wilde als for making a pesticide. Other herbs are edible, like the origanum, a wild-looking coriander and marjoram. Lemon verbena and chamomile also make great tea. When her broccoli was being invaded by aphids, she planted nasturtium, an attractor plant, and it seemed to have worked. These F1 seeds, as they’re called, are hybrid seeds developed to give a bigger harvest. However, if you collect seeds of the plants, they will not grow the same way. She has one raised bed where parsley, chamomile and celery are thriving, along with some bulbs so that she’ll have spring flowers. There is a pot filled with purple pansies for winter colour: A blueberry bush is waiting to be planted out. The front section of the garden is mostly waterwise with a huge lavender bush which turns out to be four bushes together; a tall protea and a tree. In one corner she has built a feature with a dry river bed and grasses. When it rains, the river bed fills up and the frogs are happy. In another corner are roses and a fuchsia, which were there when she moved in. The roses grow tall and protect the fuchsia in summer, but they have been hard pruned and it’s the fuchsia’s chance to flower. I’m not sure about copyright issues here – but its an article about my best friend, so I hope the Argus have no objection to my republishing it here. But to adhere to some formality and give full credit where it is due, this article appeared in Cape Argus Life on Wednesday, July 27, 2011 and is © The Cape Argus. Wow! What an accomplishment! I love how you worked so many important messages into the article…for example companion planting, composting, and heirloom seeds….all in one article! Congratulations Barbie! Love the idea of a tea garden. Thank you!! I also totally love your coconut ice sunflowers – amazing!! Congratulations to Barbie!!! How very exciting – and I can’t believe she didn’t tell you! What a pleasant surprise! My buddy did know about the article. It was great to have been chosen, Christine thought that my garden would be interesting because it is so new. My mom saw this article and since you are based in Philly she cut it out for me to read – I told her I have met and chatted to you already! Congratulations to both of you Unfortunately, I only buy one paper a week, the Weekend Argus (my assistance to save the trees during the week LOL), so I didn’t see the article. Thanks for sharing it with us, Christine. 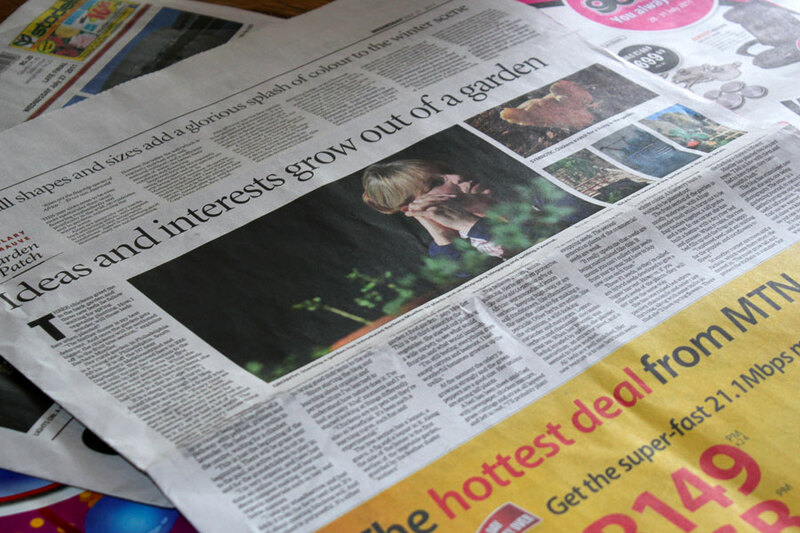 The Argus chose wisely – you do have an excellent gardening blog! Congrats on the article. But what just happened to Blotanical. A new header popped up and to pick a post there are no hearts! Just happened on your blog too. I picked right before this and I had an option of how many, here it was just one pick. It’s really wonderful to see garden bloggers across the world finding each other and creating such strong friendships. How lucky you are to find Barbie and her garden. Congratulations! I like the contemplative you in the photo. Well done, fabulous! So nice to read this. Amazing, well done Barbie! I saw the article – its lovely and nice pics of you and chickie! Of course, this just means more pressure on Barbara or next year’s article might be titled “Gardener deals with defeat” or “My garden ate my life” or something similar. Oh how funny. love the garden eating my life…… I must stay focused otherwise my hubby will buy me a rake for Christmas …..
haha, a rake for christmas!!! thats hilarious! Thank you my best buddy, all I can say is …. If it wasn’t for you and the gardening blog I would not make such an effort. I guess I wouldn’t be this far….. You give me inspiration!! !